April 29th. Bob and Gill Berry. Bob and Gill Berry makes their first visit to us as a duo but many of you will know them as organisers of Chippenham festival. Equally at home in the intimate surroundings of a folk club (they run one themselves) they will fit right in here. 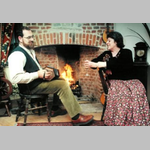 Their repertoire covers a variety of songs both Traditional and Contemporary. They have two lovely rich singing voices with many of their numbers accompanied by Bob. They will serve up a feast of singing. A night to look forward to.